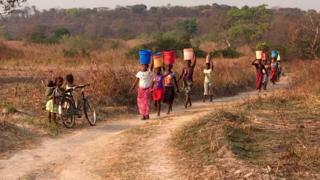 Zambian villagers are taking a multinational copper mining firm to court in the UK, accusing it of poisoning their water. The BBC's Nomsa Maseko visited the area which has allegedly been polluted. Dressed in colourful sarongs and t-shirts, the women of Hippo Pool village collect their water on the banks of the Kafue River on Zambia's copper belt. As the sun sets and the weather starts to cool down, they carry the water in large buckets which they balance gracefully on their heads as they walk back home. It is water they will cook with, clean with, drink and irrigate farms. But a catastrophe may be looming. When I visited, I could smell and even taste the pollution. The communities of Hippo Pool, Kakosa, Shimulala and Hellen say the Mushishima stream and the Kafue have become rivers of acid. Hundreds of villagers who claim copper mining operations in the area have poisoned their water source and destroyed farmland are taking Zambia's biggest copper mine, Vedanta Resources Plc, to court. Leaked documents, that the BBC has seen, appear to show that Vedanta Resources - through its Zambian based Konkola Copper Mines (KCM) - have been spilling sulphuric acid and other toxic chemicals into the water sources. A whistle-blower, who worked for 15 years with KCM, alleges that since Vedanta bought the mine in 2004, corners have been cut to save the costs of running operations. "I see an environmental catastrophe coming our way," said the source, who asked not to be named. "The lives of the people will be shattered. "I decided to speak out because I could no longer be part of the destruction any more because the next generation will not have kind words for us,"
Konkola Copper Mine (KCM) denied in a statement to the BBC that it had failed to maintain critical equipment adequately or that heavy spillages and massive leakages occurred due to degraded equipment and leaking pumps and pipes. KCM went on to say that it has spent $530m (£350m) to improve the environmental performance of its operations. This includes replacing slurry waste pipelines to the pollution control dam and putting in a new smelter, which it says captures 99.7% of sulphur emissions. The soil in the copper belt used to be rich and highly productive but now produces virtually nothing. The community believes this is due to pollution entering the stream. Leo Mulenga's only source of income used to be farming. The 65-year-old showed me cassava plants which normally reach up to four meters in height. His were not even one metre tall and they were dying. "I used to grow cabbages, potatoes, tomatoes and bananas but now, there's no future here - only poverty and suffering for everyone because this land is damaged and spoiled," said Mr Mulenga. Walking around the dry and dusty farmland, I saw a thick sludge of copper sulphate residue. Near it was a shallow well from which the community draws their water. There is only one water source for the children at Shimulala Community School. We took a sample of the water which was cloudy and had a foul smell. A few minutes later the colour of the water turned bright orange and the smell was overpowering. The damage is not just to the farmland and water supplies - people's health is also being affected. Floribert Kepapa draws water from the Kafue River. He spent four months in hospital battling paralysis and stomach pain. He also lost his wife and baby son to illness. He believes the water is to blame and he holds the copper mine responsible. "The water was clean before KCM took over. If my children and grandchildren are to survive and live healthy lives here, then KCM has to go," said Mr Kepapa. Paralegals from a British law firm Leigh Day recently visited the copper belt to gather testimonies from 1,800 members of the community in Chingola mining town. The villagers have joined forces to take their pollution claims to the High Court in London, where proceedings have been issued against Vedanta and Konkola Copper Mines KCM. KCM insist that it is minimising the environmental impact of its operations because, it says it "cares for its employees, the environment and communities around its mining areas". But this is not the first time Vedanta has faced facing legal action. In 2011, the Lusaka High Court ordered Vedanta Resources and KCM to pay approximately $1.4m (£900,000) to 2,000 residents of Chingola after sulphuric acid and other chemicals spilled into the confluence of the Mushishima stream and the Kafue River in 2006. In his ruling, the judge said Zambians "should not be dehumanised by greed and crude capitalism which put profit above human life". Vedanta later appealed against the judgment, denying that it was responsible for the pollution. Even though the verdict was upheld, the Supreme Court significantly reduced the compensation to people affected by the leakage. Resolving these latest claims could take years. Until this case is heard, and possibly settled, the real price paid for copper could be one of poverty and hardship for communities living in the boom and bust of the Zambian copper belt.